A wounded French soldier points to a cashier's window distributing aid to a line of citizens. 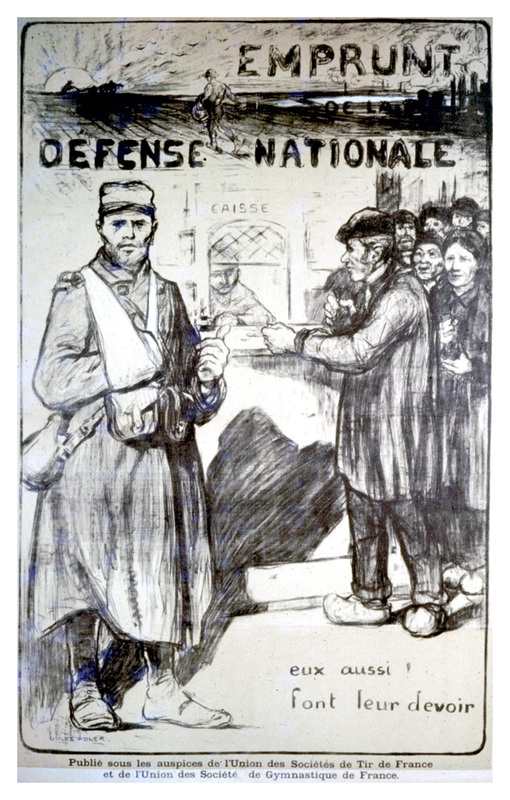 Poster Text: EMPRUNT / DEFENSE NATIONALE / - EUX AUSSI! / FONT LEUR DEVOIR / PUBLIE SOUS LES AUSPICES DE L'UNION DES SOCIETES DE TIR DE FRANCE / ET DE L'UNIONDE SOCIETES DE GYMNASTIQUE DE FRANCE [National Defense Loan - They also! Do their duty - Published under the auspices of the Union of Shooting Societies of france and the Union of Gymnastic Societies of france].